Happy Spring! This weekend, I am going to New Jersey to visit Preston's family for Easter, so I thought I would do a Spring-themed manicure for the occasion. I have also been dying to use my new spring pastels from Julep again! I thought a water marble would be a great design for the season. Now, I am definitely not a pro at this method (& all three of my attempts are documented here, here, & here), but I always have fun doing it & it still looks so cool no matter how 'flawed' my technique is. So here is try number 4! 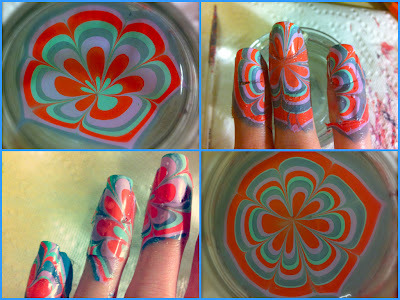 For this design, I used all Julep polishes. 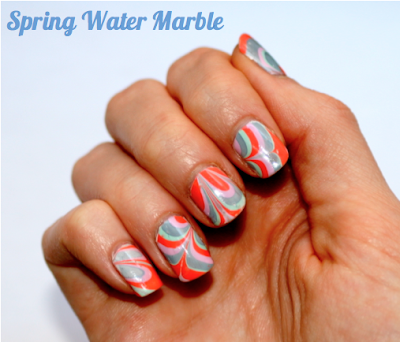 They worked great for marbling, so start thinking of colour combinations! The coral (Teri), mint (Shenae), & lilac (Simone) are from the March Maven box (seen here) and the blue (Julianne) is from the February Maven Box. I always paint both of my hands, but I rarely take pictures of my right-hand. I ended up liking the designs on my right hand more than my left so now there are even more pictures! In doing this, I found out it's rather difficult to take pictures with the DSLR left-handed...though fun fact: I was born left-handed. My nails just scream "Spring!" to me! Which is exactly what I was going for, so despite the water bubbles and the other little flaws, I am very happy with this nail art! Below are some "work in progress" pictures! This looks awesome! So difficult and intricate lol I know for a fact I probably wouldn't be able to do it. Fantastic job! !